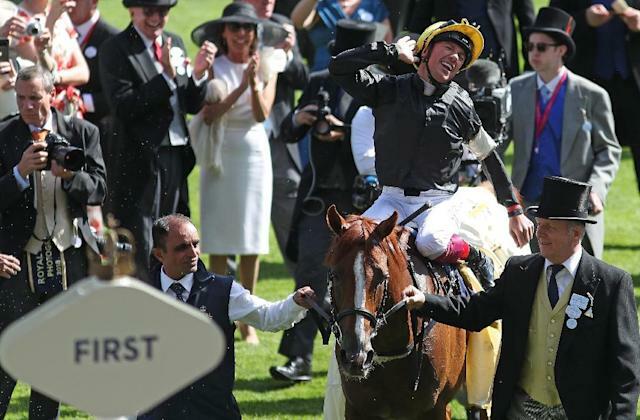 London (AFP) - Stradivarius moved to within one win of a million pound ($1.3million, 1.1million euros) bonus with a gritty display on Tuesday to take the Group One Goodwood Cup for a second successive year. The John Gosden-trained stayer -- who won the Ascot Gold Cup last time out -- took the feature race on the first day of 'Glorious Goodwood' under Andrea Atzeni, deputising for the suspended Frankie Dettori, over tough-as-teak pace-setting Irish raider Torcedor. There was not such a happy ending for Queen Elizabeth II's runner Call To Mind, who broke down in the finishing straight but was able to walk into the horse ambulance. Stradivarius will head to York next month hotly favoured to win the Group Two Lonsdale Cup and secure the bonus for winning that race as well as the Ascot Gold Cup and the Goodwood Cup. "This was a tremendous horse race," said Gosden. "They both fought it out hard, we passed him and he came back. "They criticise four white socks and a white face but he's got a lot of heart and he had the race under control in the last furlong. "He's the most charming horse to be around, he's a real gentleman." Stradivarius is the first horse since Proverb in 1973/74 to win the race aged three and then four, both times with Atzeni in the saddle. "He is a different horse from last year," said the jockey. "I am very lucky to be here with Frankie suspended." "He's a lovely horse and can only get better and definitely the best stayer around." Earlier, Dark Vision, the 10/3 favourite, captured a fourth Vintage Stakes for trainer Mark Johnston. The ungainly two-year-old won for the third time in three starts after making up huge amounts of ground under champion jockey Silvestre de Souza to go away with the Group Two prize. Dark Vision, who cost just Â£15,000 ($19,600, 16,800 euros) as a yearling, earned quotes from 16/1 to as big as 33/1 for next year's mile classic for colts the 2000 Guineas -- a race that Johnston captured with another Vintage Stakes winner Mister Baileys in 1994. "I never really thought when I sent him off for a race at Yarmouth he would be winning a Group Two," said Johnston of his winner. "Absolutely could be a classic horse but I will want to keep peoples feet on the ground." The victory edged Johnston one step closer to becoming the most successful British trainer of all time in winners. He needs another 18 to overhaul the retired Richard Hannon Senior, who sent out 4,193 (all but 48 of those on the flat). Veteran trainer David Elsworth recorded an 18th Glorious Goodwood winner as Sir Dancealot won the prestigious Group Two Lennox Stakes -- and a healthy cheque of Â£170,000 -- thanks to a sublime ride by legendary French jockey Gerald Mosse. The 51-year-old -- who numbers among his many top-grade wins the Melbourne Cup in 2010 on Americain -- threaded his mount from last to first and through the field to edge out Suedois, with last year's winner Breton Rock in third. "He is a Group One horse, he is a magnificent animal, it is an honour to be on board him," said Mosse.